Were the pay incentives received by County Manager Mandy Stone, Assistant Manager Jon Creighton, Sheriff Van Duncan, Clerk to the Board and Public Relations Director Kathy Hughes, retired tax director Gary Roberts, Air Quality Director David Brigman, Identification Director Patricia Freeman, former County Manager Wanda Greene and others all done according to the Personnel Ordinance which was duly approved by the Buncombe County Board of Commissioners and which was in effect at the time of the payment? Thank you very much for your help processing the request! The documents responsive to the request are attached. The Personnel Ordinance in effect as of October 2nd can be found at the following link. This request is in process and I hope we can have the information to you tomorrow. 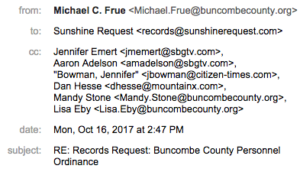 We just received a new request for information that may be available in your office, via SunshineRequest.com! Earlier in September, Mandy Stone let me know that you should be my point of contact for these requests.